So Tuesday and Thursday I teach late in the day, often not leaving campus until 5:30-6pm. So increasingly those mornings are the days that I have meetings off campus and then scoot over around 10 or 10:30, either in the car if I can arrange it, or on the ferry. So today I run over to get on the ferry, and realize that Woodside does not stop running at 10:22, it stops running at 9:52. So I missed the ferry. “Not a problem”, I think, “I will go to Alderney and take the 60.” No dice. Because the ferry is only running every half hour and I just missed it. One ferry is out of service for a couple of weeks, and my understanding is that Metro Transit rotates out another ferry for routine daily maintenance each day – this explains why Woodside stops running at 9:52 and does not start again until mid-afternoon. The only seats are on the other side of the gate. I back up take a picture and leave. I spent $16 on a cab. So is this the Halifax version Toronto Subway guy sleeping on the job? Not really, but, I’ve been taking the ferry for 38 years and God bless her heart, but, really? Really? Your job is to make sure people put in a ticket, money, or like me, show a pass. You can still read your magazine while doing that. Anyway, I still love the ferry and MT in general, they do a good job with insufficient funding, and the ferry is frankly a pleasure compared to driving, but wow, what about customer service? 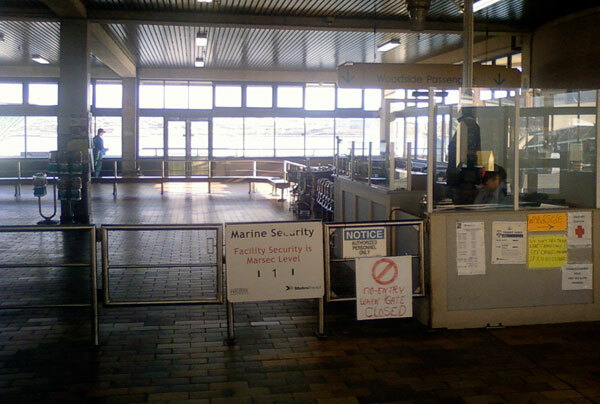 Halifax Ferry Terminal, Nov 18, 2010, about 10:20am.